Attention : the course contains numerous parts on path of mountain where it is not easy to run, in particular in the zone of Néouvielle (around cabane Aygues-Cluses). Idem in Luz Saint Sauveur with in addition pastas and compotes. At Piau, Hount de Cluzet, refuge Espuguettes and cabane Aygues Cluses: water only. It is possible to make forward clothes and resupplying to Luz Saint Sauveur life base. One bag of 20 l will be handed to every participant at the time of the delivery of bibs. This bag must be handed to the organization before 8 pm on Thursday. It will be returned on arrival on Saturdays late in the afternoon. The departure will be given on Friday at 8:30 am in Piau-Engaly. 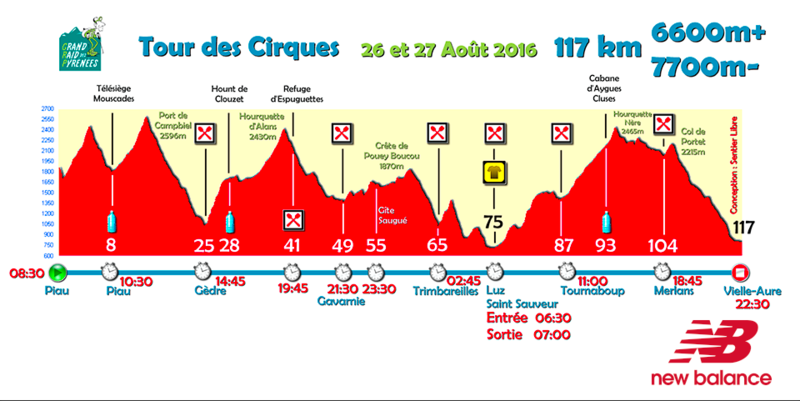 We start with a small loop at the top of the station to watch the Cirque de Barroude and spread the runners. Then crossing the Port Campbiel allows to see the Vignemale and join Gèdre.A steep climb leads in front of Cirque de Troumouse then enters the wild Cirque d’Estaubé. Hourquette Alans toggles in theCirque de Gavarnie which you reach the bottom, at the foot of the Grande Cascade. From the village of Gavarnie, a section alternating ascents and descents on mountain pastures and forests that we reach SaintSauveur where we find the course of the Ultra and life base Luz Saint Sauveur. 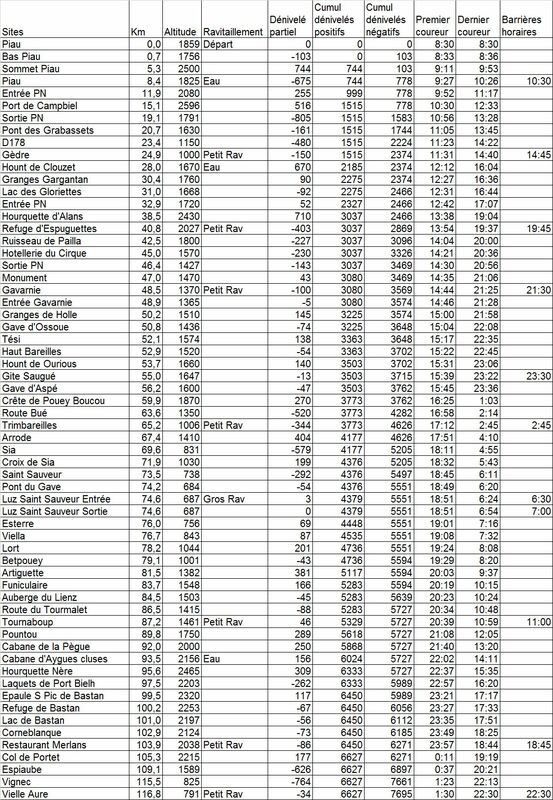 It then rises slowly above Barèges then theparking Tournaboup to return to the area of Neouvielle, cross Hourquette Nere and join the Col de Portet which brings in VielleAure. The best could finish in approximately 16 hours whereas the hourly barriers are adjusted so that the last ones end within 38 hours. The file of the kilometers and altitudes is HERE . The Google Earth version of the course is downloadable HERE. The race course can be seen HERE.